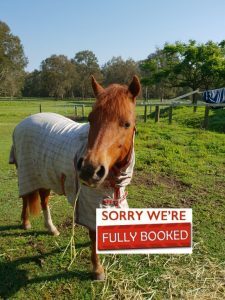 Holiday Programs & Group Bookings - Arundel Park Riding for Disabled Inc.
During the school holidays, we offer a variety of different programs open to all riders of differing abilities. These programs consist of half-day programs, full-day programs, one-off lessons, and trail rides. Each holiday we have a new program with different themes. We do have limited numbers and due to high popularity, it’s best to book in early to secure a place. All programs are run by qualified coaches with the support of trained volunteers and reliable horses. Sunscreen and bug repellent is provided but it is recommended to bring your own. All riders are encouraged to wear a shirt with sleeves and a collar and to bring a hat. Please ensure riders wear long pants. Helmets and riding boots are available to loan on the day. Participants are required to bring their own morning tea/lunch/afternoon tea and a drink bottle. Please call our office on 0755940305 or email on info@arundelparkrda.com.au to book your place now! Places book out quickly so a deposit will be required to secure your session.